Last week I went to a folk show completely smashed, and freaking loved it. 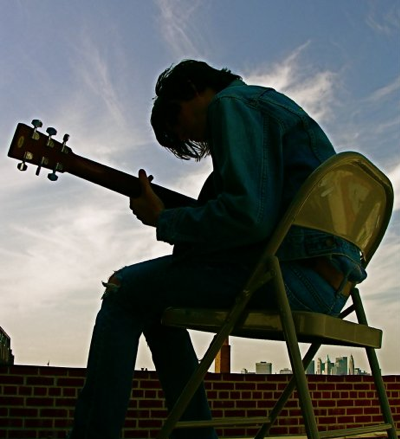 Zachary Cale is a little known (but you SHOULD know) modern folk meets orchestral elegance meets Leonard Cohen musician. In May he released an album off of All Hands Electric called Noise of Welcome. Set in The Knockout, a dive bar in Outer Mission (check out the root beer floats! ), the crowd was sparse but sincere. Cale is a twenty-something Brooklyn-ite with a shaggy haircut reminiscent of 90’s grunge (no plaid sweatshirt around the waist though) and comfortably worn cowboy boots. In person, his voice was warm and had less of the Dylan-esqe nasal quality that his album embraces. During the show it was just him up on-stage with an acoustic guitar, brooding and waxing poetic to the darkened bar. Even though many of his songs include horns and strings, the minimalist set-up did the intimacy of his lyrics justice, and he appeared to be crooning many of these mournfully gorgeous tunes to a very pretty blonde in the crowd. Lucky girl. He’s been labeled by Pop Matters as “the best singer-songwriter working right now. Period.” If that isn’t enough to convince you, it looks like he’s going to be playing at the Go Folk Yourself Festival in Brooklyn on the 20th and after that he’s off to tour in the UK, Germany, and Netherlands. Buy a ticket or buy the cd (or go nuts and do both) and help support this guy.